Description: CSX Q62119 has a short train to take north. Description: CSX Q62119 crosses Old Rices Rd. just south of Watertown. Description: CSX Q62119 crosses over main St. in Watertown. Description: A typical 2 mile long CN Train M396 rolls through East Church Street Crossing in Savoy. 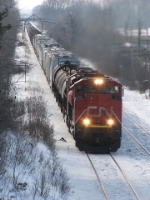 Title: CN 8011 at Mile 5.8 Strathroy Sub. Title: It's an SD70M-2 parade! Description: The camera is not tilted, the motor is. Description: CN intermodal rounds the bend at McCowan Road crossing. Description: CN 8011 trails a westbound mixed freight at Irene, IL. Description: CN 8941 leads a westbound mixed freight at Irene, IL. Description: An ex-Santa Fe C40-8W trails behind an SD70M-2 at Codes Corners. East of Kingston ON.